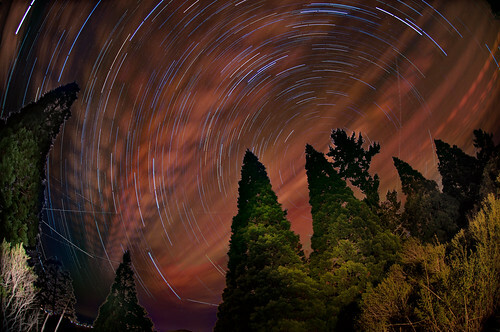 Urban Star Circles, photo by Harold Davis. View this image larger. Star trails—and star circles—are tough to pull off in an urban environment because of all the ambient light pollution in the environment. You don’t really see the stars when you live in a modern city; for example, most urban dwellers have never seen the Milky Way in all its glory. 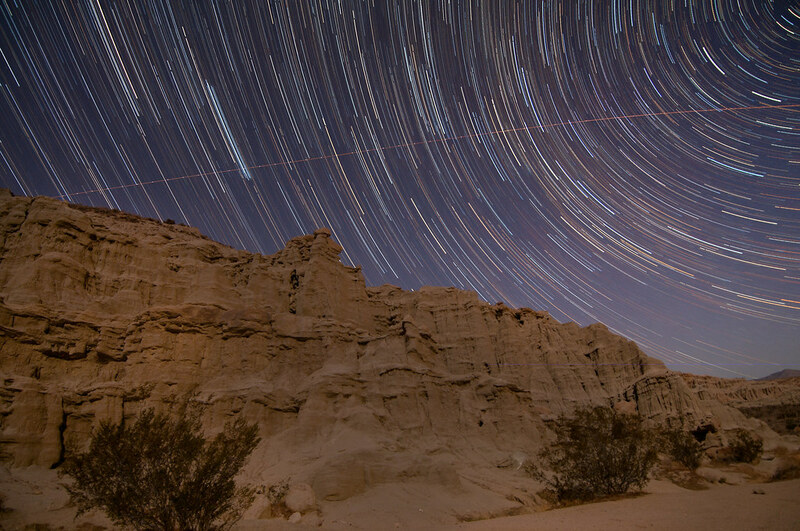 The relative brightness of the night skies means that the contrast with star light is greatly diminished—making dramatic captures with star trails more difficult. I think this linked night shot of the Golden Gate Bridge works—but only because the quadrant of the sky showing star trails was to a considerable degree isolated from the ambient light of San Francisco, and the foreground reflections of the bridge are also interesting. Last night seemed crisp and clear. My idea was to go up into Tilden Park and find a north-facing location that was somewhat protected from the ambient urban light. As you can see, as plans often do with night photography this one went somewhat wrong—because of the strength of the overall ambient light even deep in the park, and because of cloud cover. I shortened the exposure time from what I would usually use in the deep night, and made 47 exposures, each one at 90 seconds, f/2.8 and ISO 200 (for a total exposure time of about an hour and ten minutes). In addition, there are a few frames of light painting of the trees in the foreground. You can see many airplanes flying into (or out of) Oakland or SFO in the bright, night sky. But for me, the most interesting thing about the image is the way the light—from East Bay cities and San Francisco—has formed beams projecting against the high clouds that are in motion. I see the light patterns against the clouds in the sky as almost like the patterns in shadows you can see when you shine a light through Venetian slatted blinds. 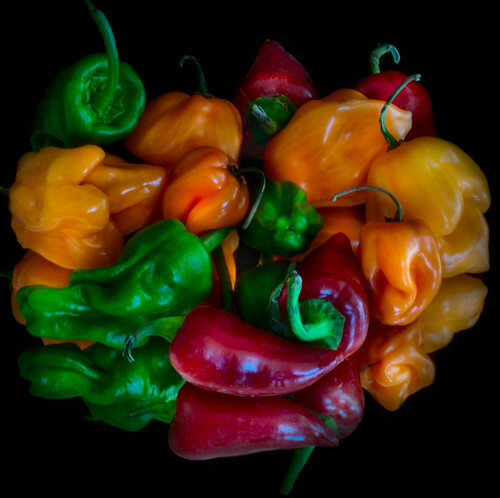 Hot Bouquet, photo by Harold Davis. View this image larger. The morning has some real autumnal crispness, and there was frost on the ground when I walked the boys to the school bus stop—unusual for coastal California. So if you want to imagine feeling hot by comparision with the weather outdoors, consider taking a bite of one of these babies. Photographed with my 85mm perspective-correcting macro on a mirror with a black velvet background. And best wishes staying if not hot, then at least warm! 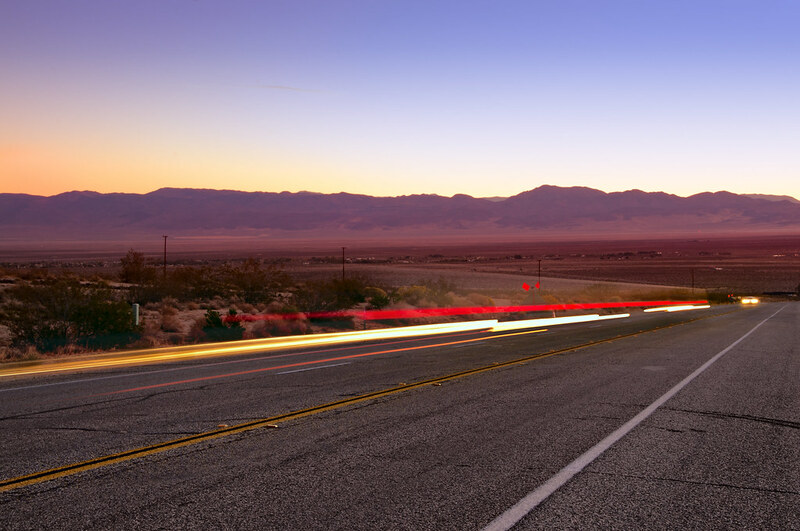 Morning near Inyokern, photo by Harold Davis. View this image larger. Consider the life of the itinerant night photographer: I’m up all night photographing, or finding my way into location, catching a bit of sleep while the camera exposes on auto-pilot. But there’s more to photography than darkness even for dedicated night photographers—so I spend my days shooting, scouting locations, and driving to the next location. In these circumstances, coffee is not about gourmet texture, flavor, and bouquet—it is a caffeine delivery system. Sometimes I’ll make myself a cup of instant (Trader Joe’s has some surprisingly good instant stuff) on my camp stove during the watches of the night. But more likely when dawn comes I’ll find a place to eat in the nearest town, and grab breakfast—the greasier the better, so long as it comes with unlimited coffee refills! The truth is that sometimes when I’ve been in extremis with several days and nights of back-to-back shooting and travel I’ve even resorted to the ultimate in obnoxious caffeine delivery: those little orange bottles that have some kind of energy mixture, taste vile, and contain caffeine. Considering my perspective, I read Frank Bruni’s recent New York Times column Loving Coffee without Being a Drip with some bemusement. Bruni manages to fill a surprising number of columns with his angst that as a “foodee” he prefers a caffeine delivery system such as Mr Coffee to more exotic ways to prepare his brew (in the article, there are various amusing accounts of some arcane and expensive ways to make a cup of coffee). 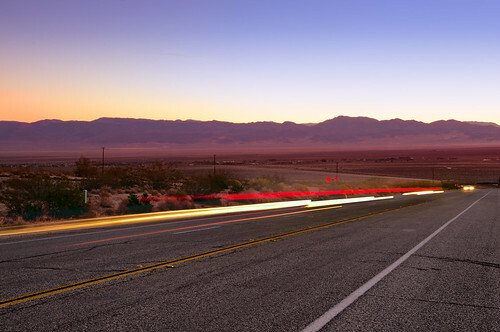 The photo at the beginning of this story shows California Highway 178 with the town of Inyokern in the background shortly after dawn. Inyokern lies about 50 miles to the northeast of Mojave, California. To get there, I started after the kids were in bed, drove through most of the night, and spent what was left of it in Red Rock Canyon taking photos (there’s one at the bottom of this story) and napping. I was on the road early, and snapped this photo before heading into Inyokern for breakfast. There are about 900 people who live in Inyokern, which was probably more prosperous when the Lone Pine to Mojave train line came through the place (the town was originally named “Siding 16”; this train line no longer exists). It’s in the Indian Wells Valley; these wells are now the property of a micro-brewery that sells its beer through Whole Foods Market (I mention this in order to link my story back to the gourmet-food-coffee theme that I started on). Inyokern is also notable for the presence of the Mojave Green Rattlesnake, a creature that combines the normal rattler pit venom with an advanced neurotoxin that paralyzes its victims. Fortunately, these deadly creatures are pretty much not aggressive, so if you don’t step on one, or put your hand on one by mistake in the dark, you won’t get bitten. I think you probably get the idea by now that Inyokern is a pretty hot, dry, dusty, and run-down place. But I was glad after shooting this photo of sunrise coming up while cars still had their headlights on to stop in the only restaurant in Inyokern. It’s notionally a Mexican place, and had just opened when I came in at 7AM. Besides my coffee with many refills, I had an omelette filled with mystery meat. Since it kind of tasted like chicken, for all I know I was eating Mojave Green Rattler. Red Rock Canyon, photo by Harold Davis. View this image larger. 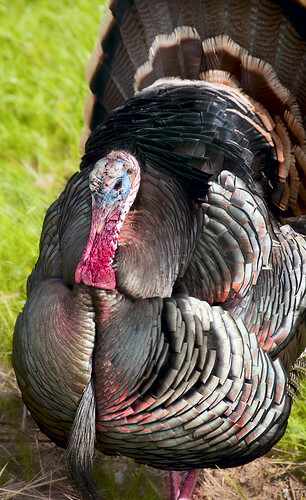 Wild Turkey, photo by Harold Davis. Read the original story behind this image. We all have many things to be thankful for—a view of life this wild turkey can certainly subscribe to as he struts his stuff in Tennessee Valley. Far better to be alive in such a beautiful place than stuffed on someone’s dinner table. Desert Skies, photo by Harold Davis. I’ve travelled with my FindMeSpot for several years, as an emergency precaution in case something happens to me in the wilderness in the watches of the night. I’ve also recommended this emergency satellite contact device in my night photography workshops. But recent experiences have caused me to reevaluate how worthwhile this subscription-priced device really is. The device isn’t seemingly very complex to use. It runs on Lithium batteries, has a power button, a button that automatically sends an “I’m OK” contact email (pre-written on the website), a Help button that sends out a pre-written “I’m not doing so well” message, and a 911 button that is supposed to call emergency search and rescue services (an appealing feature of the subscription is that it includes insurance covering the search and rescue). I’ve never had occasion to send any of the emergency messages, but I’ve sent contact messages a number of times over the past couple of years. You turn the device on by holding down the power button for a couple of seconds until the power light starts to blink, then hold the OK button down for two or three seconds until a second light blinks. Notionally, when contact is made with the satellite and the message is sent, there’s a long pulse on this light and then it stops blinking. My experience in sending these messages is that the device has worked…some of the time. My theory has been that it depends greatly on the portion of the sky that is open to the device; in other words, it is not likely to work well under dense forest cover. In fact, I have found the device generally pretty flaky, even with open skies above it. On my recent trip to the Racetrack Playa, in a remote corner of Death Valley, I had the device face up to a clear sky trying to send the message for four or five hours. Nothing went through. If you had to hold it down with such precision for it to work, then the device would be pretty much useless. I don’t mind so much that it didn’t work in Death Valley, but the utter rudeness of customer service is totally unacceptable. My apologies to anyone who has subscribed on my recommendation. I can guess why this company doesn’t get more complaints about their service: my thought is that people buy it, subscribe, and then never really use it in wilderness conditions. Don’t say I haven’t warned you: the Emperor has no clothes, and FindMeSpot Not! Beneath the Wave, photo by Harold Davis. View this image larger. Please join me on Wednesday, December 1, 2010 at 10AM PDT for an interactive webcast. There is no charge to attend. This event is a bit like a workshop—except that you can particpate from your computer anywhere. 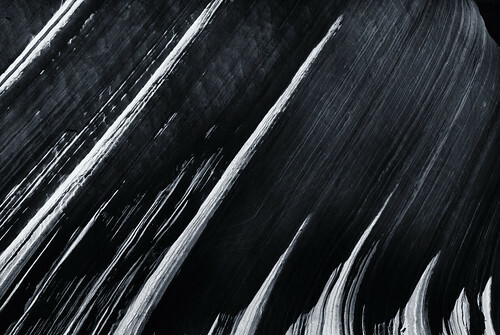 The subject is Digital Black & White: Tools and Techniques for Enhancing the Monochromatic Vision in a Post-Film World. In other words, I’ll be doing the vision thing about black & white, and also discussing technical issues. Please bring your questions! Pre-registration is required, but the event is free and ten signed copies of my bestselling Creative Black & White: Digital Photography Tips & Techniques will be raffled after the event to attendees. Registration for the event here. 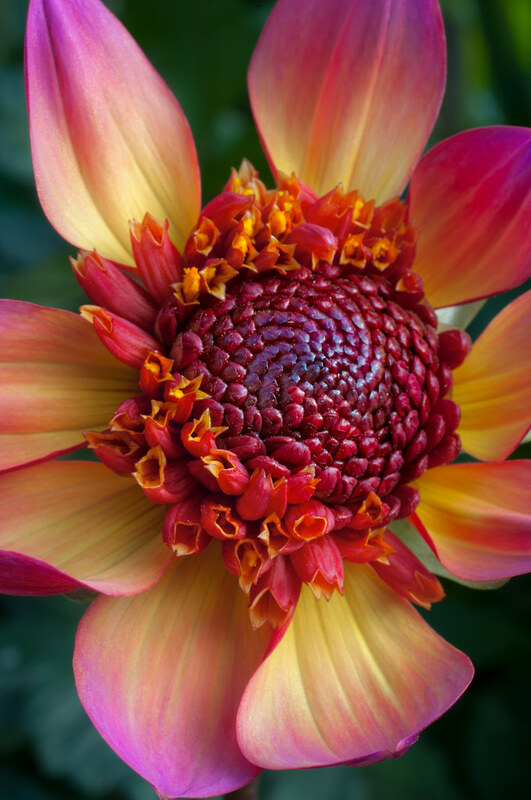 Briefly noted: Here’s a rather pretty Dahlia from my files, shot last year in the gardens of the Golden Gate Park, San Francisco. Nick Is Nine, photo by Harold Davis. Happy Birthday, Nicky! We celebrated this weekend with a noisy, chaotic, and fun house full of kids. 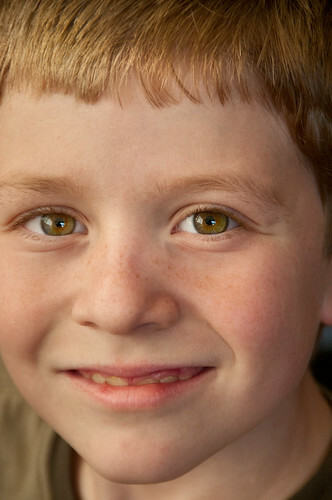 Nicky is a wonderful kid, now—and all along the journey. He’s thoughtful, creative, considerate, fun, and full of life. He is simply the greatest! Improbable Stair, photo by Harold Davis. View this image larger. I put this impossible image together using a cloudscape from the Bay area and the stairs at Scotty’s Castle in Death Valley. 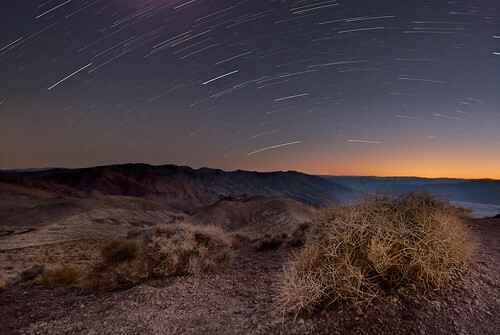 A third piece—the sunburst—comes from the Devil’s Golf Course, also in Death Valley. It’s no secret that I have a weakness for spirals. The original image that is the base of this composite seemed to call out for clouds (thanks to Photoblog 2.0 reader Wanda particularly for suggesting it). 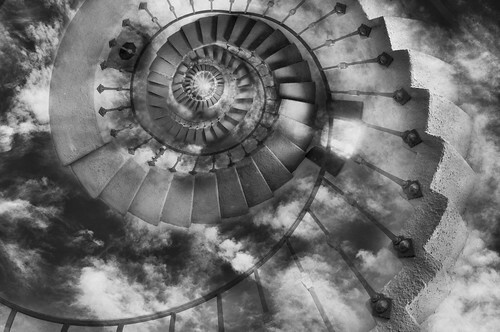 Garth Nix’s Keys to the Kingdom series—beloved of my kids, and I like it too!—features an improbable stair, and I borrowed the title for this image because it seems to fit so well. Light Star, photo by Harold Davis. View this image larger. 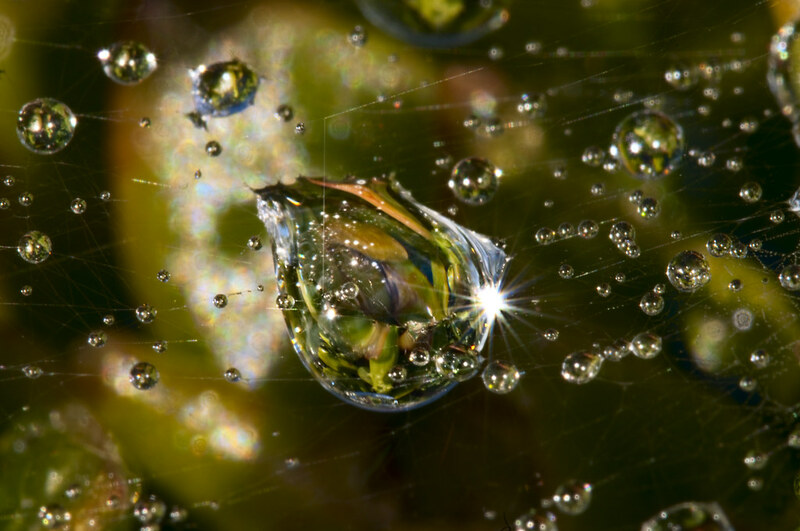 This is a water drop shot from the rainy season last year (taken in early February). Now that it has started to rain again this year, I’m looking forward to shooting more water drops. There’s something about the water drops created naturally and found on location that beats anything one can construct. I guess you could say I’m an all-natural earthy-crunchy kind of water drop guy! Seaweed Salad, photo by Harold Davis. View this image larger. On a trip up the California coast to Mendocino, Nicky and I stopped to photograph a beach near Point Arena. The weather was overcast with brightly lit fog—the perfect natural diffuser. 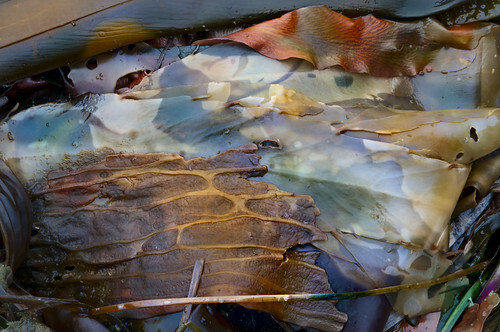 I turned my macro lens on the luminous piles of kelp and seaweed lying at the tide line—and proceeded to slip and fall into one. Nick thought this was hilarious, and “Dad slipped in the seaweed salad” has become something of a family punchline. I don’t entirely get the joke, but I love the textures, colors, and shapes found on the rugged beaches of California. 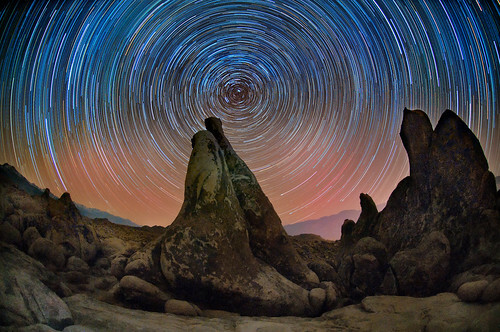 Stars My Destination, photo by Harold Davis. View this image larger. This is a stacked composite of 27 exposures, each capture shot at 4 minutes, f/2.8, and ISO 400. 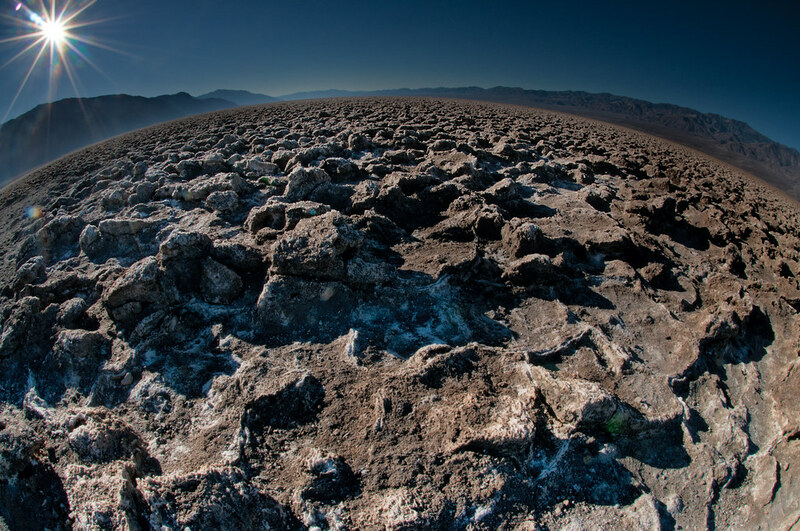 I used my 10.5mm digital fisheye, and as you can see the image is pretty much pointed north up Owens Valley from our location in the Alabama Hills. Total exposure time was about 108 minutes, or one hour and 48 minutes. To process the images, I opened them all using Adobe Camera RAW, and synchronized the settings. There were a few frames that needed work to take out elements that would have distracted—such as airplane trails and traces of a green laser pointer on one of the rocks. In Photoshop, I painted these out crudely using a black brush—knowing that the stacking process would insure that my “retouching” didn’t show, since only the brightest pixels would be picked. Next, I saved all the images as PSD files and closed them. I used the Statistics action—available in the Extended version of Photoshop—to stack the images, with the Mode set to Maximum (as I mentioned, the point of this was to make the combination using the brightest pixels). I used a lighter version of the final frame—there had been some light painting on the rocks—to brighten the foreground. It was easy to add this to the composite with a layer, layer mask and gradient. The formation to the right of the image is called “The Three Nuns.” While we were all exposing we had a nice little midnight party, located constellations and with hot chocolate and marshmallows for those who wanted them. By the way, I named this photo after a novel by Alfred Bester, with a plot that resembles The Count of Monte Christo, except that it also involves “jaunting” to the stars. Devil’s Golf Course, photo by Harold Davis. View this image larger. Briefly noted: I scouted Devil’s Golf Course in daylight before spending the night. To create the sunburst effect shown in this shot, I stopped my fisheye down all the way (to f/22). 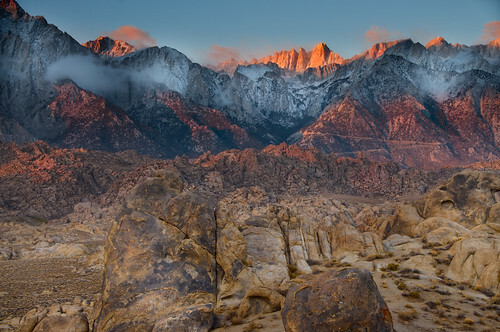 Alabama Hills Sunrise, photo by Harold Davis. View this image larger. As the sun cleared the Panamint Range to the east, it lit the rocks and textures of the Alabama Hills and the snowy elevation of the High Sierra crest all the way up to Whitney. 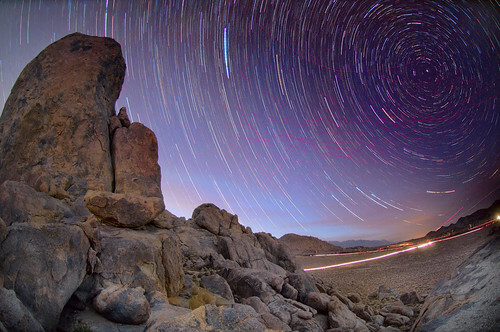 I was in position below the location of this night shot of Alabama Hills. Camera on tripod, I shot three exposures at 1/10 of a second, 1/30 of a second, and 1/80 of a second. Each capture was taken at 48mm, f/8 and ISO 100. The 1/30 of a second exposure became the background layer in Photoshop because it was the best overall exposure, although the sky was too light and the foreground rocks were too dark. It was easy to use the 1/80 of a second exposure to darken the sky, and the 1/10 of a second exposure to lighten the foreground. In each case, I achieved the combination in Photoshop by aligning the image as a layer on top of the background, and using a layer mask and a simple gradient to blend the different exposures seamlessly—an excellent example of how hand-HDR techniques can avoid the artificial look of many HDR landscapes. This is a view facing north from the Gunga Din formation in the Alabama Hills above Lone Pine, California. On Friday night we took the workshop to this area for the first shoot. The formation is named after the famous movie Gunga Din staring Cary Grant and others, and filmed in the 1930s mostly in this location. To make this image, I climbed up about a hundred feet to a small saddle, and left the camera on auto-pilot to take photos while I circulated among the workshop attendees down below. Getting up there was no problem before dark, but finding my way up and back to take my camera down in the pitch black was a little less easy. The “spider web” of red tail lights in the sky come from the many jets that flew overhead during the shoot—mostly military I suspect from the nearby China Basin Naval Air Weapons Station and Edwards Airforce Base. Hearing the supersonic boom as one of these airplanes flew by left me thinking that the world would probably be improved if we switched the military and education budgets around. Then again, it would probably take quite a few bake sales to pay for the fuel burned up by that web of fancy planes in the sky.